In 1940s street parlance, to frame is to ensnare or catch: "I was set up! "; "He was innocent, but the police framed him." In framing, someone creates evidence to project the appearance that the target carried out an illegal act. For instance, a framer might plant at a crime scene a drinking glass with the target's fingerprints. 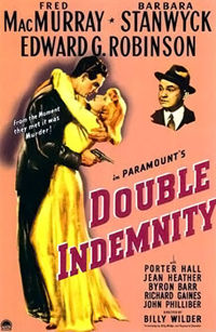 Theatrical poster for the 1944 film, Double Indemnity, directed by Billy Wilder. The film tells the story of a plot to murder the husband of the seductive character Phyllis Dietrichson, played by Barbara Stanwyck. Her co-conspirator is Walter Neff, played by Fred MacMurray. Although the plot itself doesn't involve a frame, as the story unfolds, a threatened frame does become part of the complex tale. In organizational politics, frames need not meet the standards of evidence that a court of law requires. Political frames often consist of interpretations, innuendos, privately voiced assertions and vague accusations. Moreover, political framing isn't necessarily carried out before the fact. The innuendos and accusations usually occur after an incident, as the framer provides an alternate interpretation of that incident to disparage the target. Here are some of the communication techniques of political framers, and a few suggested counter tactics. To further an appearance of probity and reason, the framer can make innocent-sounding requests for information. Phrases like "help me understand," or "can you clarify" might appear. The questions themselves provide the framer opportunities to add to the frame. For instance, the framer might ask, "I've been told that you assassinated President Lincoln. Can you confirm that this is a simple misunderstanding?" The accusation is nested in a seemingly reasonable request for a denial, but the request itself gives the framer a chance to spread the accusation. When this occurs, the damage is already done. Although it's tempting to say nothing at all, remember that silence can be interpreted in many ways. A response is required, but if it's anything more than a simple, straight, and serious denial, you risk making the problem worse. a court of law requiresor might already have happened. For instance, the framer might make an accusation directly to the target, having already prepared the audience by making that same charge — and more — in a more private venue, excluding the target. Targets, believing that they know the full scope of the problem, then address the charges they know about. The framer is then free to fall back on already-prepared ground, leaving the target's carefully prepared defense unanswered and effectively deflected. As a target, it's wise to assume that the framer has had more communication with others than you know, and that some of those others are convinced that you've done and said what the framer claims. When you hear of new charges, try to draw out more, to get everything on the table before trying to turn things around. To avoid further spreading falsehoods, privacy is best, but privacy is not always possible. Would you like to see your comments posted here? rbrenDkvRZarnNYkcbjkSner@ChaceCseWMrnCFPTNHhnoCanyon.comSend me your comments by email, or by Web form. I offer email and telephone coaching at both corporate and individual rates. Contact Rick for details at rbrenXjMEpaeEiRFAGxWoner@ChacMInirBjYKPrRInkooCanyon.com or (650) 787-6475, or toll-free in the continental US at (866) 378-5470.